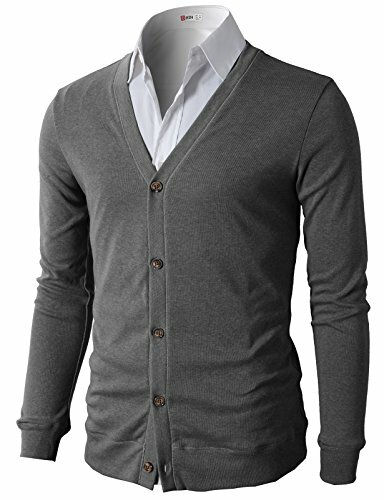 * Our Cardigans are Slim Fit. So If You want to loose fit, You Had Better Order One Step Bigger Size than Your Original Size. * High quality & versatile. And Brings you simple & effortless style along with comfort. Also, It makes an excellent gift on any occasion. US Small (Asia M)------Shoulder 15"----Chest 39"-----Sleeve 25"-----Length 26"
US Medium (Asia L)------Shoulder 16"----Chest 41"-----Sleeve 25.5"-----Length 27"
US Large (Asia XL)----Shoulder 17"----Chest 44"-----Sleeve 26"-----Length 28"
US X-Large (Asia 2XL)----Shoulder 18"----Chest 48"-----Sleeve 26.5"-----Length 29"
US 2X-Large (Asia 3XL)----Shoulder 19"----Chest 52"-----Sleeve 27"-----Length 29.5"
US 3X-Large (Asia 4XL)------Shoulder 20"----Chest 56"-----Sleeve 27.5"-----Length 29.5"
Fashion solid color long sleeve cardigan with solid knitted in premium cotton fabric, five button fly closure. Perfect for work dress,school,party,ceremony or other casual occasions. Keep you warmin cold days. Also, A basic wardrobe staple versatile enough to wear all year round.